This is part two or the more advance version of the stationary bike workout. Part one is for beginners. If you need to know how to do the exercises, I have videos listed on the stationary bike workout part 1. If this is your first Tabata workout, it is 20 seconds of very hard exercise for 20 seconds with 10 seconds of rest. Tabatas are supposed to be 4 minutes long or eight cycles of 20 seconds work and 10 seconds rest. To understand the science behind the Tabata workout, read my post on this extreme form of cardiovascular exercise. 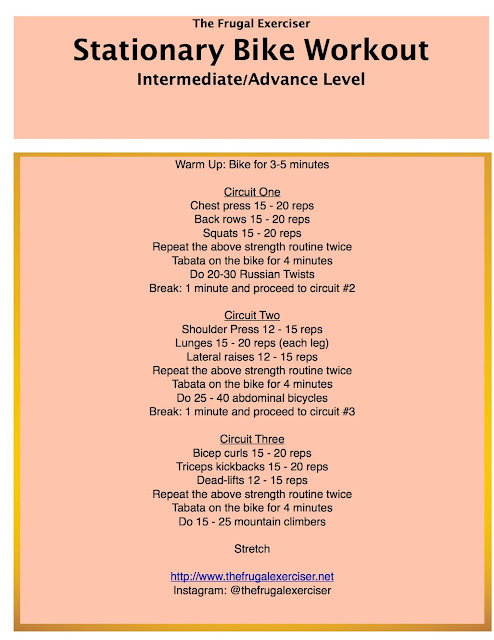 Remember for this workout, you will need weights and of course your stationary bike. Don't let your bike sit in the corner of your basement or bedroom, get it out and try out the beginners or advance stationary bike workout. It is a total plan to help you increase your aerobic endurance and your strength fitness.